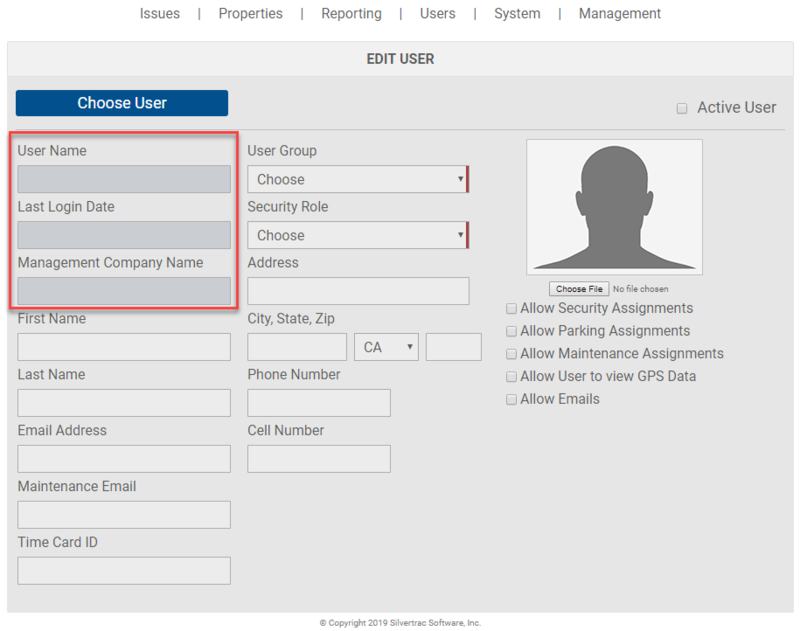 Can I Change the Management Company a User is Assigned to? Once you set up a Customer User in Silvertrac and place them under a specific Management Company, you cannot change the Management Company they are assigned to. Example: You have a client who used to work for Company A, but now works for Company B and you wish to keep them under the same username and edit them so that they are under a different Management Company. NOTE: in the User Profile the User Name, Last Login Data and Management Company Name boxes are all Gray. This indicates a box of data that cannot be edited. In order to set the user up under a different Management Company you must create a new account for this user. Any data created under a specific Management Company or user account, belongs to the company, not the user. This data safety rule also applies to any employee user who may go to work for another security company using the SilverTrac reporting system. All user accounts stay with the original Admin owner / creator.